On June 8th I will get my next ultrasound to find out if I will be buying pink clothing or more blue clothing for my baby! I am beyond excited! I would love your help! Please comment here whether you think I will be having a boy or a girl. Feel free to ask questions if you would like. There is something in it for you! If it had been more pinkish, it would have been girl! The company that makes Intelligender has now launched an all natural remedy line too called IntelliCeuticals. Pregnant women Our holistic products bring quick relief to the symptoms women preparing for the pregnancy journey experience, like anxiety about your ability to conceive, and imbalance in physical, hormonal or emotional areas. Once your baby is on the way, IntelliCeuticals offers natural aids to help you adjust to your changing body, and prepare for delivery day, comfortable nursing and the return to pre-pregnancy normalcy. After baby arrives, a new mom experiences changes to her skin, body, hormones, mood, and sleep patterns. Your energy level and ability to sleep and relax are challenged as you attend to baby’s needs and schedule. IntelliCeuticals has formulated natural aids that are effective and safe for nursing mothers. As the newborn settles in to the family, moms need healthy solutions to comfort and bond with her baby, overcome early discomfort in breastfeeding, and establish a healthy flow of breast milk. Baby’s skin changes too, and mom can find safe, natural relief from the dry flakes that come with cradle cap in time for picture day! IntelliCeuticals’ experts have formulated remedies for your growing family with high quality ingredients drawn directly from nature to care for you and baby. Not only did Intelligender send me a test to review, they also sent me some Harmonic Baby Massage Oil. I look forward to slathering it on my new baby. Thanks to this lovely company, you will have the opportunity to win a wonderful gift basket full of amazing items! By commenting on this post to guess the gender of my baby, you will be able to win this amazing prize. 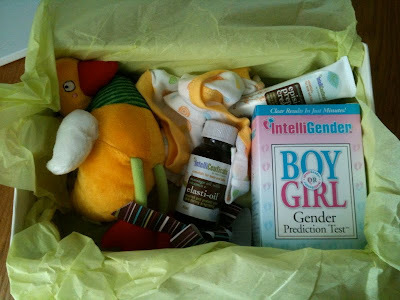 Included in this gift box are the following items: 0-3 month onesie, Intelligender test, baby toy, Intelliceutical Elasti*Oil, Episi-Prep Cream and a really cute humpty dumpty box! Just comment below telling me which your gender guess is! Thats it! This contest will end on June 8th at NOON EST. Good Luck! It is open to US and Canadian entrants! I think it's going to be a boy!!! I probably found you on a giveaway linky. My guess is a BOY and that would make me way jealous!!!! I found your site while looking for recent posts on the Intelligender product. I'm going to go off and say a girl. That was my first "thought" on what you are having. I'm really curious though to see if it is accurate or not. I'll be watching. This is too cool. 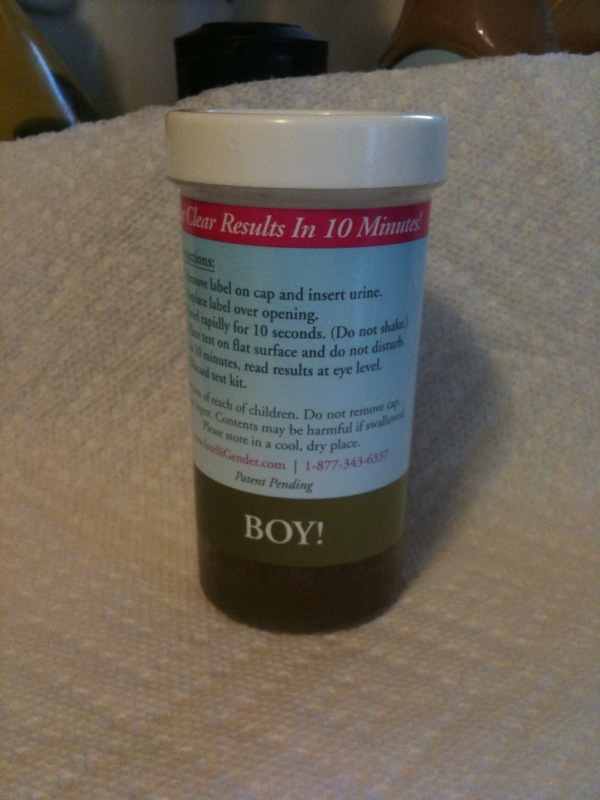 I'm guessing you'll have a boy with those results! Snips & snails and puppy dog tails! I'll go with Boy ~ as it seems like it is a boy year for many expectant moms I know! Since everyone else is guessing a boy...I'll say girl, all sugar and spice. I know you'll luv either!!! I have one of each and luv the differences. Good Luck and thanks for the giveaway. Girl....I know lots of girl pregnancies now, and they tend to run together. Found you in a giveaway linky. I found your site through a low entry giveaway link! I entered your 7th generation giveaway! I think you are having a boy! I found your blog by googling Intelligender!! !